Is Google Docs a good alternative to Word? My new computer has no word processing software, and I'm thinking about just using Google's online word processor instead of spending the money on Microsoft Word. Are there are significant features I'd have to live without, or other factors to consider? Can Google Docs Replace Microsoft Word? Google Docs is the search giant’s cloud-based productivity suite for the masses. It’s free of charge and includes generous storage allotments that do not count towards your 8GB GMail storage limit. Along with spreadsheet and presentation applications, Google Docs includes a word processor. Is it good enough to replace Microsoft Word? For the vast majority of users, the answer is YES. In fact, Google’s word processor may be better for the average user than Word, simply because Docs is much easier to learn. It’s also much simpler. For example, Google’s word processor includes a couple of dozen popular fonts, eschewing the bewildering pantheon of bizarre fonts that comes with Word. Fewer choices can mean more productivity. Because Docs is web-based, there’s nothing to install, and you’ll never have to download security patches or updates. It doesn’t matter if you have a Windows, Mac or Linux computer, you just pop into Google Docs with your web browser, and you’re ready to write. And in contrast to Word 2010’s $139 price tag, Google Docs is free. It’s for that reason alone that many schools, non-profits, and government offices have dumped Word in favor of Docs. In terms of word processing features, Google Docs has everything you might need whether you are a lawyer writing a court brief or a bride designing invitations. All of Word’s editing, formatting, and style functions are in Google’s word processor. You can insert links, images, ad hoc drawings, footnotes, headers/footers, bookmarks, etc. You can adjust line spacing, alignment, indentations, and paragraph styles. Bullet and number lists are a breeze. Tables are easily composed. Printing can be a bit different in Google Docs. But it’s still pretty easy. If you use the Google Chrome Browser, just select File > Print from the word processor’s menu. A dialogue box for selecting your printer and print settings will appear. Click the Print button when you’re ready. Google’s word processor has a spellchecker that is enabled by default. A misspelled word will be highlighted by a red underline. Right-click on a misspelled word for a list of suggested replacements, then choose the correct word. You can also enable auto-correction of frequent misspellings. Collaboration is easy with cloud-based documents. Google’s word processor includes a sharing setting to enable multiple authors to work on a document. Each author's changes show up in a unique color, making it easy to identify who typed what. This is a big improvement over the frustrating alternative of sending copies to a group of people, and then tediously merging all their changes into a master document. It’s also easy to track revisions, and email copies of a document to multiple parties. What can’t Google’s word processor do? Each document has a one gigabyte limit. Complex formatting is sometimes lost when files are closed and opened again. And it can be difficult to precisely place objects on a page and have them stay put. Some users report that fonts and line spacing are not consistent when a Google Docs file is opened in Word. But for ordinary writing tasks, even relatively complex things with footnotes and headers, Google’s word processor is an adequate replacement for desktop Word 2010 software. Is There a Microsoft Word Online Version? I’d be remiss if I failed to mention that Microsoft also has an online version of their Microsoft Word product. And for home users who are already familiar with the desktop version of Word, the Word Web App may be the better choice, because it’s practically a clone of Word 2010. Of course that means you’re back to the more complex array of options and features in the Word interface, but if familiarity is what you want, this is it. Document compatibility between the online and offline versions of Word is sterling, and it matches Google Docs when it comes to sharing and collaboration features. The downside of Word Web App is that it’s only free for non-commercial users. Businesses must pay for access through Office 365, which starts at $6 a month, per user. Then there's also the webmail consideration. If you're a diehard Gmail user, you'll probably find Google Docs is better integrated into your workflow. Those who live in the Microsoft world of Outlook and Windows Live Hotmail may be more at home with Word Web App. 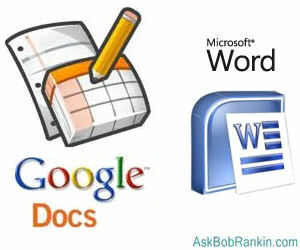 Most recent comments on "Microsoft Word vs Google Docs"
Bob, you forgot to mention the fact that if his new computer is windows based, he does in fact have a built in word processor. It is WordPad which I use all the time to rough out my documents. It works great and has enough formatting options for creating lightweight to medium documents. You could have mentioned "Open Office" as an alternative if he wanted something to use locally if he can't get online. You can't get much better for free. How does OpenOffice stack up against Google Docs? Is it worth changing from OO to GD? I use Open Office Libre Writer, which works pretty much the same as Word, and it's just fine -- and it's free! Cloud computing is great if you're in a 1st-world environment: outside that, it's not an option. Strict enforcement of monthly bandwidth usage levels mean that storage and retrieval becomes extremely expensive. Some operators in South Africa offer as little as 500MB per month, with the biggest, non-commercial, offering at somewhere around 10GB per month. That's assuming you can get reception in the first place - I'll stick to the PC-based version. My group chose Google Docs specifically so that "official" documents could be shared. Our users vary in their levels of sophistication, with some being afraid to stray from the familiar. Sadly, when users use different browsers, printed versions of the document look different, some of them bad. Also, it is my impression that some browsers eliminate some of Google Docs' capabilities. One feature I really miss in Google Docs Spreadsheet is the ability to insert an individual cell. You can only insert a complete row or column. So you have to cut and paste to free up the single cell. I'd recommend LibreOffice, too. As a former MS Office user, I haven't found anything MS Office did that LibreOffice can't do just as well. Plus, the price is right. As a well-satisfied Google docs user, having spent 8 years in Bangladesh and now 2 in Vietnam , I can tell you that a 1st-world environment is not a necessity. The bandwidth requirements are actually quite light. The main difficulty can be a reliable electric supply, but that is a problem for both platforms. I'm a teacher and the sharing features allow collaboration among students that is difficult to achieve with a file-based word processor. Google always concerns me as being very nosey. What are the privacy implications? Would I be right in assuming that Google will look at my docs and adding data extracted (even anonymously) to its vast banks of information? For fast, powerful and full-featured word processing, spreadsheet operations and presentation graphics, LibreOffice will make you wonder why you did not use this free productivity suite sooner. LibreOffice also includes a database, math program and vector drawing application, so there is simply no reason to pay Microsoft rates for most office operations. Both LibreOffice and OpenOffice once used essentially the same codebase, but an essential difference has developed. When $28 billionaire Larry Ellison (Oracle Corporation) bought Sun, he claimed he owned Sun-contributed open code and ignored the open source community development process. Gmail is one of the best things Google has offered for free, but when it comes to Google Docs, I will pass. The company I work for uses it for everything, but as someone else has mentioned, it loses it's "flair" when it comes to creating a presentation style document. That and others in the company who are not of the "learned" can really screw up a shared document. If I had to go with a document maker that is free, I would go with OpenOffice for sure. Google Docs looks like something an elementary student can learn on and then move up later on. Open Office has everything MS Office has plus when you copy you don't need to hit the 'enter' key, it doesn't double up the msg whatever. Just carry on no problem. I find it better and also has other apps too. Can't beat free, free, free. If you just start using your first document and you like GoogleDoc as your favorite fanclub, just do it. The actual problem in the world of wordprocessing ( and of course, other office software) is the compatibility. If you create your document with normal text, that's fine. But, you have your own style or proposed by the software, then, when it looks good or smart on one software, it will probabaly not do on the others. The biggest problem with online word processors is that they're...ONLINE. Want to edit a document while on the go? Better have a real office suite (openoffice, libreoffice, MS Office)on your machine. Network or internet down? time for that coffee break I guess...deadline or no deadline. That plus the fact that I don't trust MS or Google (or anybody else) not to read my documents means that I won't be giving up my local word processors and spreadsheets any time soon. The whole thing is reliant on the Web being available and usable. Nothing can beat having your documents locally. I only have one document floating in the clouds, my resume. If anyone needs (or I want to give) my resume to, I can do so from my phone. Other than that, I would never want to be hostage to the Internet. Remember, absolutely never forget, every connection is "best effort" and no one can guarantee availability. Sure, you can say that your own computer can give up the ghost, you still should have backups. I upgraded my hard disk to a solid state disk and although it took some time, and since I use a Mac, I have Time Machine and was able to restore everything, chose all the files and in 3 hours, I had everything back. For my Windows machines, there is a similar product, so every machine in our house has a Time Machine like backup application. Nothing is better than automatic backups. For Word, the best free option is Open Office. You should still use Google Docs if you need to share and need collaboration, but that should be just for certain selected documents. just yesterday only i tried using the googledocs instead of mso 2010 on the firefox browser v.9 [for transliteration purpose ]; i can't use the right--click option nor can i change the font size ; an error message that the clipboard functionality is not enabled in the browser appears ; i had to use the 'edit' button on the browser menu every time . I have found Google Docs for collaboration purposes to be woefully lacking. I have a group of people that I want anyone in the group to create a document from a template and edit it. I decided to try to pull this off using Google products as I'm trying not to fragment my application services across multiple providers. What I seem to be finding is that although Google has IMMENSE resources at their disposal, the integration of Groups and Docs appears to be woefully lacking in features. This may force me to go evaluate Microsoft's offerings. - Modification notifications appear to only be available for spreadsheets. Doc it appears you can only be notified regarding new COMMENTS, not doc modifications? Have I overlooked a bunch of features? Is there a different Google App I should be using? Or is this just apparently the sad state of things right now?